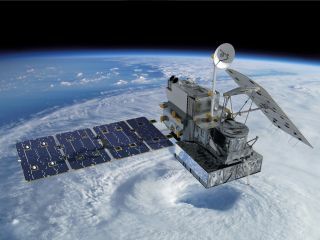 An artist's illustration of the Global Precipitation Measurement Core Observatory satellite built by NASA and JAXA to measure the Earth's rain and snow fall like never before. The satellite launched on Feb. 27, 2014 from Japan's Tanegashima Space Center. Floods ravage Texas while drought parches California. Areas of the Midwest get as much as 6 feet of rainfall. It has been a wild 2015 for United States weather, and more changes are coming when El Niño takes hold in the Pacific, a NASA scientist said. The agency has 20 Earth-monitoring satellites in orbit examining the planet and providing statistics on rainfall, ground water and cloud cover. A new addition to the fleet in 2014, the Global Precipitation Measurement (GPM) satellite, is the first to provide a planet-wide view of rainfall and snowfall every three hours. "I'm also interested in taking that information and combining it with other measurements, like NASA's GRACE satellites," he said. GRACE, which stands for Gravity Recovery and Climate Experiment, is a pair of satellites launched in 2002. The distance between the two satellites changes as they orbit the Earth due to changes in gravity density below. Water can increase the gravity in a local area, so the satellites can act as a tool for NASA to measure precipitation across the world. "As a scientist, I'm using that information to understand the long-term memory of rain in the soil that allows us to look at the ways in which drought conditions are predisposed in some regions. like California or the southern Amazon, to stronger and longer fire seasons," Morton said. California and the southwest U.S. could see more rainfall as the large recurring band of warm water El Niño develops and strengthens in the east Pacific. As warm water is stored off the coast of South America, it moves the fast-flying current of air in the upper atmosphere, the jet stream, farther north and encourages rainfall in the Southwest and West Coast of the U.S. In contrast, other regions of the Earth such as Indonesia will experience less rainfall, Morton said. The agency is combining the data from its satellites with computer models to make predictions about long-term climate trends, such as more drought during North American summers, he added. More information about NASA's Earth observation program is available at www.nasa.gov/earth.